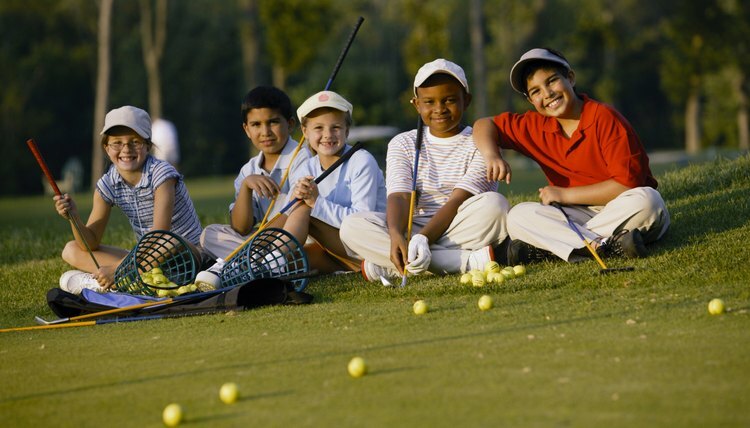 Beginning golfers should start with the basics and group lessons with other beginners is a great place to start. Golf can be quite an undertaking for someone who's just beginning the game. The amount of body movement and muscles used in the game can make it challenging. But, once you have the basics down, the game can a rewarding experience that can be pursued for years to come. A good basis of knowledge before you start playing will help get your off the tee with a solid foundation for improvement. People who have never golfed have the tendency to grab the club and grip it like a baseball bat. While it may seem unnatural at first, it's important to get the beginning golfer accustomed to using the proper grip. Take the club in the palm of your lead hand--the hand that's closest to the hole. You'll want your thumb to run along the top of the grip going down. Slide your back hand--the hand that's farthest from the hole--just below your lead hand, interlocking the back hand pinkie finger with the lead hand pointer finger. The back hand thumb should also run down the front of the grip, just below the lead hand thumb. The most important thing about how you stand in front of the ball, also called the approach, is that you are comfortable. The basics include slightly bent knees, upper body leaning over the ball, but not hunched, arms out in front of you, but not overly extended. Your feet should be shoulder width apart, and for a beginner, the ball should be positioned so that there is equal distance between the front and back foot. To figure out if you're lined up right, take a 7-iron and run the shaft from your lead foot toe to your back foot toe. The club will point to where you are hitting the ball. Now, take the club and put the club head behind the ball. It should come up at a 45-degree angle and fit naturally in your hands. The three essential steps to the golf swing are the take away, impact and follow through. Each one is vital to making solid contact on the ball. With you grip and approach taken care of, all there is left to do is to hit the ball. For a beginner, it's best to keep your feet planted during take away and impact. Your head and upper body should remain relatively still. You should look at where the ball is through the follow through. As you bring the club back, try to keep your lead arm as straight as possible, rotating your hips and transitioning your weight to your back foot. As you come down for impact, hips should begin forward rotation while your weight should shift to your lead foot. Keep your eye on the ball as you make contact and allow your hips to continue rotating. At the end of your swing, your upper torso should be facing the hole. For non-adolescents attempting to take up the game, it can be quite challenging for the body to work in the proper way. Because of this, it's always a good option to take a lesson or two before going out. If you can start with the right approach and habits before you play, you may be able to avoid some of the bad habits that early golfers have. Most courses have a pro shop with a golf pro that has the necessary skills and qualifications to get you started on the right foot in the game of golf.